The Harbour Commissioner says that in 2013, Wightlink traffic fell for the third year in a row, directly impacting their income and jobs. 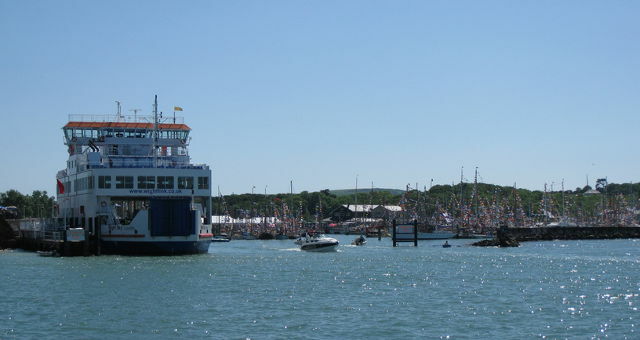 Yarmouth Harbour Commissioner (YHC) says the reduction in Wightlink‘s sailings to and from Yarmouth Harbour, first announced in November 2012, has had a negative impact on the Commissioner’s income. As well as the changes to sailings from January 2013, further sailings were cut in the summer of last year, with the YHC linking the drop in foot and car passengers to a reduction in their income. According to the report, the drop in crossings led to the redundancy of a YHC ferry terminal operator position. “The traffic Wightlink carried fell for the third year in a row, notably cars and foot passengers reduced. As a consequence, YHC’s income from Wightlink fell. Thanks to Martin Wareham for the heads-up. 7 Comments on "Cuts to Wightlink timetable impacts income and jobs for Harbour"
How much did it cost to produce this 48 page report? And could the funds used to do this be better used to improve the harbour itself? Could the people currently looking for work have helped with this? My understanding is that there’s a legal requirement for Harbour Commissions to produce an Annual Report. Having read this report the future for customers of Wightlink and Yarmouth Harbour look financially bleak but for different reasons . Wightlink are learning from their own mistakes. They call it “Economics” but it’s more like book-keeping. So what do they expect! So, WightLink cut their costs by eliminating sailings that are uneconomic, and presumably improve their profitability. Yarmouth Harbour Commissioners have a drop in income because less chargeable activity takes place. What responsibility does WightLink have to ensure that YHC maintains its annual surplus?